Saute the following ingredients in frying pan, then combine with breadcrumbs. 1 large loaf of your favorite bread, cut in small 1" cubes (shown is a mix of white, wheat and pumpernickel) baked in oven until dry and crunchy, or 3 cups of prepared stuffing croutons. In large saucepan, simmer onions, and celery in some veg broth until tender, then add the apples, mushrooms, spinach, basil, and spices. Once all is good and tender, mix in large bowl with diced toasted bread, and the 1/2 cup chopped up walnuts. Pour 1/2 cup to 1.5 cups vegetable broth over, I like mine a bit softer, so I use a little over a cup. Place in parchment lined or lightly sprayed baking dish and bake at 400 degrees for 20 min covered, 10 min uncovered or until top layer is crunchy. Add more veg broth if needed. This serves 6 easily as a side dish with approx 235 calories per serving. Eliminate the walnuts for a much lighter version. Feel free to get creative with this recipe, adding raisins or cranberries would be a nice touch as well. 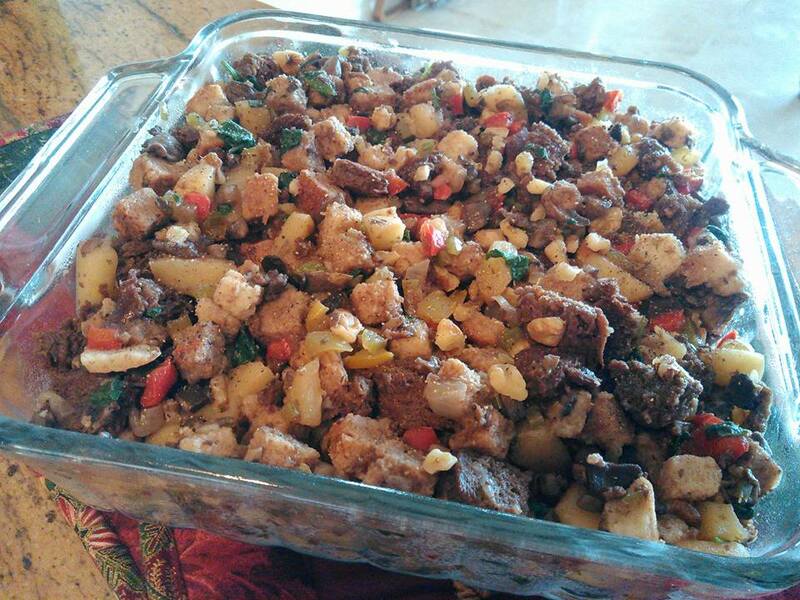 A great topping for this stuffing is some delicious plant based gravy.